Like most people, I enjoy Beethoven’s symphonies. Or to be strictly honest, like most people I enjoy parts of Beethoven’s symphonies. Like the opening movement of his Fifth, sections of the Sixth and of course the famous chorale movement of the Ninth. But again, being strictly honest, I find much of the rest rather boring. I find myself wanting to fast-forward through the parts I don’t really understand to get to the familiar themes I enjoy. Once, on a long plane flight, which had all nine symphonies on the music channel, I thought about making a play list of just the ‘good’ bits—a sort of Beethoven’s Greatest Hits. Then I felt guilty, thinking that would be short-changing the great composer. I knew there was more to Beethoven than had met my ear. All that changed when my Audio Book Club offered me a course on Beethoven’s Symphonies at a price I could not refuse. The instructor was a brilliant teacher. Instead of just playing musical tidbits, he guided me through all nine symphonies, movement by movement. He explained how these compositions were the media two hundred years ago, and the great composers were the Andrew Lloyd Webbers and Steven Spielbergs of their day. At each stage he explained what Beethoven was doing and why his music was so revolutionary at the time. I learned how Beethoven could entertain, shock, inspire and even tease his audiences. That course has revolutionized my appreciation of Beethoven’s music and whetted my appetite to learn more. I realized I was just sipping Beethoven. I now understand the music beyond the ‘that sounds nice’ stage. I know what is happening even during the ‘dull’ parts, which has greatly increased my appreciation of the more well-known themes. For many of us the Bible is like Beethoven’s music. We have our favorite verses and perhaps a favorite book, but that is as far as it goes. Today you can download a Bible app onto your i-something and make your own play list of the Bible’s Greatest Hits. Many of us no longer take a Bible to church—why should we when the scriptures are projected on the screen behind the preacher? This is progress. No one wants to go back to the days of heavy, brass-bound Bibles or scrolls. But there is a potential problem if we only experience the Bible through the fragmented images of a PowerPoint presentation. We will get to know some parables and the basic stories from the life of Jesus. We will become familiar with Paul’s teachings on law and grace. We may hear about Noah’s Ark, the Exodus and Daniel in the lion’s den. But do we know how it all fits together? 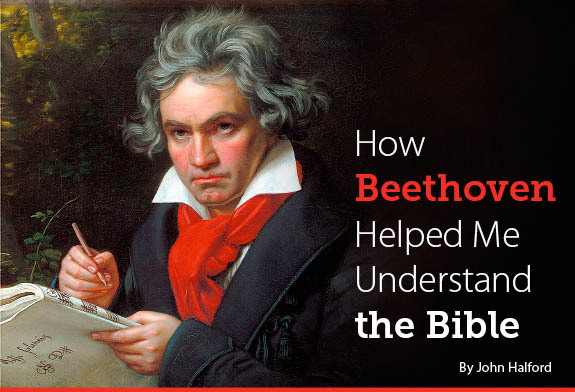 OK—much of the Bible does seem rather boring and irrelevant, as I once judged Beethoven’s symphonies to be. It is tempting to fast-forward and get to the parts that inspire, encourage and inform. After all, the Bible’s core message is about love, grace and truth. Those are the parts we need, aren’t they? Do we really need to know about all that other stuff? Notice what Paul wrote to his young protégé, Timothy: “There’s nothing like the written Word of God for showing you the way to salvation through faith in Christ Jesus. Every part of Scripture is God-breathed and useful one way or another—showing us truth, exposing our rebellion, correcting our mistakes, training us to live God’s way. Through the Word we are put together and shaped up for the tasks God has for us” (2 Timothy 3:14-17, The Message). Paul said this about what we call the Old Testament—the New had not been written yet! Take a good look at your Bible. No—not the app—the book. Do you really know what is in it? What about those books with odd names: Leviticus, Nehemiah, Obadiah? If “every part of Scripture is God-breathed and useful one way or another,” there is something in them worth knowing. The Old Testament shows us how the rags to riches to ruin story of Ancient Israel laid the foundation for the ministry of Jesus. When you understand that story, the Gospels come to life in a way you never expected. So let me ask you—are you just sipping the Bible as I did Beethoven’s music? Why short-change yourself? 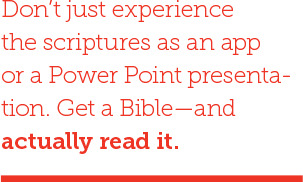 Don’t just experience the scriptures as an app or a PowerPoint presentation. Get a modern easy-to-read version of the scriptures—ideally one with explanatory notes—and actually read it. (Some suggestions include the Good News Bible, The Message, Contemporary English Version or New Century Version). As you do, you’ll see those favorite stories and scriptures in context. You’ll discover there is so much more to them than meets the eye.